Arbraska, Libérez l'aventurier en vous! Services > Directory > Lanaudière > Rawdon > Tourism association or organization > Arbraska, Libérez l'aventurier en vous! Arbraska Rawdon is an innovative project that will help you find your inner child. 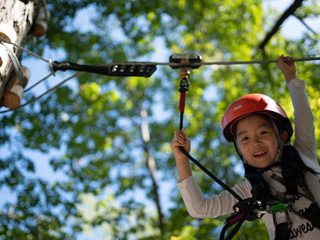 The pioneer of aerial parks, Arbraska offers visitors of all ages (from 5 to 77 years old) more than 120 treetop activities in over 8 tree-top courses. Zip lines, suspension bridges and a Tarzan rope await you on a track that promises a unique connection with nature. Arbraska Rawdon also offers the opportunity to try outdoor rock climbing on four rock faces, perched at the summit of Mount Pontbriand, that make up a via ferrata. Take your pleasure to new heights by enjoying the unbelievable views of the wonderfully preserved Launaudière landscapes. Everything you need to forget your busy everyday life!